The logo element for FIG Working Week 2019 shows the Temple of Literature, Hanoi. The Working Week is now taking shape. FIG Vice President Mikael Lilje visited the local organisers of the conference, and met with the Deputy Minister of the Ministry of Natural Resources of Environment. The logo element for FIG Working Week 2019 is selected because it comes from the Temple of Literature which is located in the city centre of Hanoi. It is a very suitable logo element for a FIG Working Week! 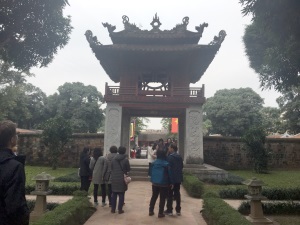 The temple was built in 1070 and was dedicated to Confucius, sages and scholars. 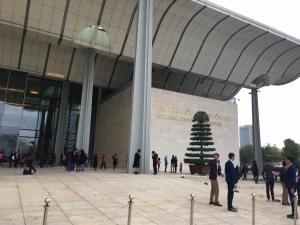 The various pavilions, halls, statues and stelae of doctors are places where offering ceremonies, study sessions and the strict exams took place. Today it is possible to access the area, see the temples and study e.g. the Turtle Steles with the names of those who were successful at the royal exams. 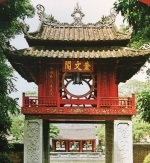 The building that is used as logo is the Khue Van pavilion which is a symbol of present-day Hanoi. 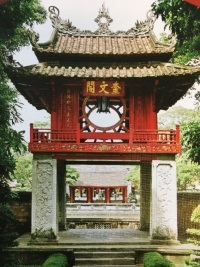 At the top is a red-coloured with two circular windows and an elaborate roof. Inside, a bronze bell hangs from the ceiling to be rung on auspicious occasions. On the day of our visit to the Temple of Literature a new electronic guide with headphones was introduced, which gives visitors the possibility to walk around on their own and at the same time get information about the different sights and their fascinating history. 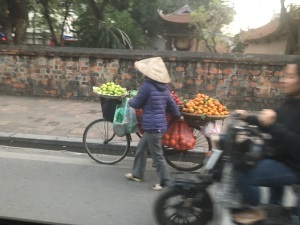 This is a "must-do" while in Hanoi! 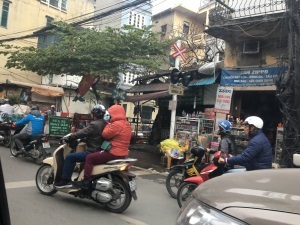 FIG Vice President Mikael Lilje and Director Louise Friis-Hansen visited Hanoi, Vietnam and the local organisers of FIG Working Week 2019. For both it was a re-visit after the successful Regional Conference that took place in 2009. With this conference in mind, the Working Week can only be very succesful and interesting. The Working Week 2019 will be held on 22-26 April 2019 and will be organised by a dedicatel local organising team, again this time led by Mr Trinh Anh Co, Co-conference Director of the Working Week. The Working Week is held in cooperation with the national member association: Vietnam Association of Geodesy, Cartography and Remote Sensing (VCGR). 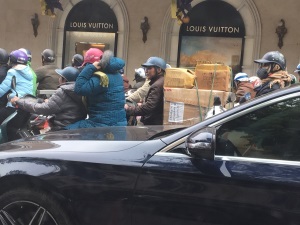 This visit included several aspects. 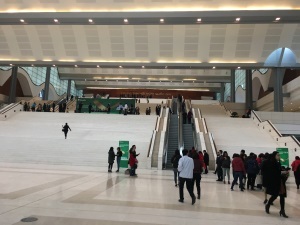 Together with administrive meetings in which the progress of the preparations were discussed, there were site visits first of all to the conference venue, the Vietnam National Convention Center, where the Regional Meeting was also held. This time due to the fact that the Working Week is larger FIG will occupy a whole floor of the gigantic conference centre. Both session rooms and exhibition will be located here. There were also visits to various hotels and possible spectacular venues for social events. Finally the local organisers had arranged several meetings with involved stakeholders. First of all the local organisers had managed to organise a meeting with Deputy Minister Vo Tuan Nhan, Ministry of Natural Resources and Environment. In this meeting the Deputy Minister gave his support to the Working Week and explained which areas that are of special interest for the Vietnamese surveyors. On behalf of FIG Mikael Lilje thanked for the support and promised that the technical programme incl. the plenary sessions will cover these areas that include: environmental pollution; disaster; geospatial technologies; new approaches on land administration; UAV's; how to involve surveyors in BIM to mention just some areas. 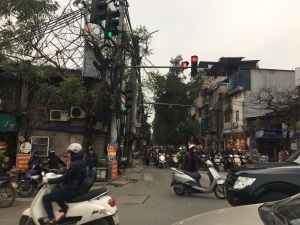 Hanoi will be a fabulous hosting city with its friendly and efficient local organisers. This together with the outstanding Vietnamese cuisine will make the Working Week 2019 an unforgettable experience. A big thanks to the local oganisers for the well organised site visit, good meetings and visits and for your amazing hospitality.